The following ARRL webinars garnered great interest and support from participants, and are now posted online. Don't miss them! Boulder County (Colorado) ARES assignments are like a box of chocolates -- you never know what you'll get. From providing communications for the appearance of the Dalai Lama to mega-concerts by superstar groups and everything in between, this versatile and talented group of ARES volunteers respond with professionalism and with state-of- the-art technologies in order to provide their served agencies with real-time situational awareness and alternate communications services. Just this summer alone, BCARES has been asked to provide voice, data and digital ATV communication services for the Bolder Boulder 10K run, public safety agencies securing the Dalai Lama visit to the city and a concert by former members of the Grateful Dead, and most recently the Cold Springs Fire, a 600-acre wildfire that threatened the mountain community of Nederland, Colorado. The Bolder Boulder 10-kilometer run had over 54,000 runners, walkers, and wheelchair racers, making it the second largest 10K race in the US and the fifth largest road race in the world. BCARES provided situational awareness via their pioneering digital ATV systems along the entire course to the finish line in Colorado University's Folsom Field. The video was sent simultaneously to race officials, the Boulder Police Department, the Colorado University Police Department and a federal agency. The visit of the Dalai Lama to the Colorado University campus packed it with more 50,000 in attendance. BCARES deployed its ATV assets to monitor the large crowds and traffic in and around the stadium. 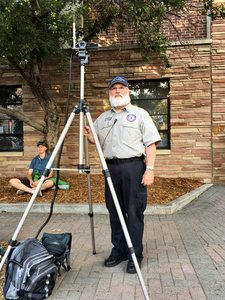 This provided the CU and Boulder PDs and event organizers with live situational awareness at their incident command posts. The following week, Folsom Field played host to concerts by original members of the Grateful Dead. They played to back-to-back sold-out crowds for both weekend nights. BCARES members again provided their video situational awareness to the police departments and event organizers, when EMTs were requested for medical incidents. The live video feed proved invaluable for event personnel to provide timely and appropriate responses. During football games in the fall season, the BCARES group uses the CU campus and Folsom Field as training grounds for their advanced digital ATV ops and test links to served agencies. Most recently, BCARES was called out by the Boulder Office of Emergency Management and the Boulder County Sheriff's Office to provide alternative radio communications services during the Cold Springs Fire. Affected was Nederland, a small town west of the City of Boulder, high up in the mountains and surrounded by State and National forest land. Forced evacuations were called for and evacuees were sent to three different locations; their large animals were evacuated to the Boulder County Fairground facilities. During this incident, no ATV was asked for due to the volatile fire situation and concern for the safety of BCARES ATV operators. Fire Incident Commanders closed many of the access roads to and from Nederland in order to provide safe routes for the wildfire crews being deployed to various hot spots. The operators did have the opportunity to prove out the BCARES Mountain Emergency Repeater Network (MERN) that had provided a critical communications platform for the area during the floods of 2013 that destroyed many communities to the north and east of Nederland. During that flood, telephone poles and fiber optic lines were down, but communication links remained intact between the amateurs and the Boulder EOC and OEM. "We were able to maintain effective communication between the hills and the valley, which was critical in meeting citizens' needs," said Mike Chard, Director of Boulder OEM. "We were able to coordinate air drops of resources via ham radio -- it was an incredible effort." The MERN was a project initiated by BCARES EC George Weber, KAØBSA, who recognized the communication gaps caused by fire damage to communication and commercial power infrastructure, and planned power outages. Cell phone coverage is spotty; the Internet and wireless services go down. The MERN, a network of 2-meter repeaters, was designed to bridge these gaps, and constructed thanks to the donations of Boulder area hams and other funds. The installation was performed by BCARES personnel. Community leaders partnered with BCARES and its instructors and VEs taught licensing classes and administered the exams that yielded so many new licensees from the mountain community. BCARES members re-purposed older VHF radios, and gave them to each new licensee to use in weekly training nets. These new, local hams have since organized their own inter-mountain radio net; many have upgraded their licenses and radios. They recently formed their own ARRL affiliated club -- Indian Peaks Radio Club -- and installed their own repeater, used in conjunction with the original MERN system. For the recent fire, these residents-hams of the mountains monitored their repeater, the MERN and BCARES ops at the Boulder County EOC, as well as local fire and police frequencies for up-to-the-minute situation reports on fire parameters, conditions, evacuations, road closures, and weather conditions. They relayed information to and from their area shelters and sent current assessments to Boulder County emergency officials. When the wildfire was upgraded, operators stayed on task. BCARES recently incorporated the Everbridge System, an app provided to the group by its served agency and put into service for this wildfire. Everbridge sends messages to all BCARES members via telephone, text message and email, and allows emergency managers to track geotagged tweets that contain specific hashtags and use this information to respond to incidents as they occur. The app allowed members to respond to duty requests, allowing full staffing throughout the incident, and freeing the repeaters of these requests in favor of emergency communications. Huntington Beach (California) RACES (HBRACES) was activated on Saturday, June 4, 2016 when the power went out at both the Huntington Gardens and Five Points senior residences. The buildings are each 14 stories tall. At the Huntington Gardens when the power went out, a generator supplied power to the hallways and elevators, but there was no power to the individual living units and telephone system. Consequently, the residents had no lights or any way of calling 911 in case of an emergency. At the Five Points Senior Apartments there was complete power failure, with no generator, lights, nor elevator service. The facility was in complete darkness. Huntington Beach RACES (Radio Amateur Civil Emergency Service) and CERT (Community Emergency Response Team) members were immediately activated by Brevyn Mettler, Emergency Services Coordinator. An automated call-up, email and text alerts went out to all RACES and CERT members. Steve Graboff, W6GOS, RACES Chief Radio Officer, and Steve Albert, KE6OCE, Assistant Radio Officer, started a two meter net and logged in responding and available communicators. Within minutes, operators checked into the net were advised to proceed to the staging area at the entrance to the City Council chambers at the Huntington Beach City Hall. Graboff said "the response to the call to activation by HBRACES was impressive. The professional communications skills displayed by the operators were outstanding. The quality of HBRACES training was clearly evident in all of our responders, including those deployed in the field and others who were assigned to the incident command post. I am extremely proud of the Huntington Beach RACES response to this immediate, unexpected, call to activation." HBRACES communicators were paired with a Huntington Beach CERT responder, and the pairs were assigned to each floor of the two facilities. With this arrangement, both communication and rapid response functions would be available in the event of any emergency or priority situation. This was the first time Huntington Beach RACES and CERT members had been deployed in pairs, whereas previous joint deployments had them working cooperatively but not directly together. They were assigned a 12 hour shift from 6 PM to 6 AM. Given the loss of electricity with blacked-out buildings, housing many frail and elderly residents created a dangerous situation, not only for these residents but also for the volunteers patrolling the floors of the buildings in the dark, looking and listening for people in need of help, or criminals looking to take advantage of the situation. Not only was immediate aid available to the residents, but essential direct emergency communications to the Huntington Beach Fire and Police Department was instantaneous. These agencies continually supported the efforts of HBRACES and the CERT throughout the duration of this incident. Although the Red Cross typically does not respond to localized power outages, in this case they dispatched a canteen truck to support the volunteers with snacks and coffee. The cause of the power failure was a chain reaction fire/explosion in the underground southern California electric vaults in the area. Graboff said "the pairing of RACES and CERT brought an impressive set of skills together to serve the health and welfare of all at the incident site. Having both organizations working together created a safer environment for the volunteers since they were not alone. They also brought essential communications and CERT training to each floor of the buildings. RACES and CERT worked well together, and I believe this is a response model we will use again in the future." Carol Burtis, the CERT Coordinator, said "this event turned into an extremely well-coordinated mutual-agency response situation and proved the ability to rapidly stage on the order of 60 people in a very short period of time. The reward came the following morning when several residents thanked the RACES and CERT volunteers for being there; one resident said specifically 'that knowing we were in the hallway was the only thing that allowed her to get sleepy that night.'" It was found that 12 hours on duty is a long shift, especially in the dark of night, so in the future RACES may adjust its protocol to a shorter shift time of 6 hours, staging personnel to rotate every 6 hours and rest in between. The FEMA Disaster Emergency Communications (DEC) Division effects services and information systems critical to the agency's role in coordinating the Federal government's response, and support for communications to emergency responders at all levels of government. The Division helps establish interoperability during operations anywhere in the country. In 2007, Congress established 10 Regional Emergency Communications Coordination Working Groups (RECCWG) to support its mission. These groups serve as a coordination point for Federal, State, local, and Tribal officials as well as private sector service providers and volunteers at the regional level. RECCWGs address the survivability, sustainability, operability, and interoperability of emergency communications. The focus and direction of the RECCWGs is determined by the RECCWG members in each Region. Recently, the FEMA Region IV (AL, FL, GA, KY, MS, NC, SC, TN) RECCWG members formed an auxiliary communications working group to improve the relationship between agencies and auxiliary communications volunteers. Well-known veteran Winlink administrator and emergency management/communications advisor Steve Waterman, K4CJX, a RECCWG member, was asked to chair this working group. Objectives include providing a model plan for regional agencies wishing to incorporate qualified auxiliary communications volunteers, mainly Amateur Radio operators. Other goals are to enhance working relationships among these volunteers, groups such as ARES, the agencies they seek to support, and other radio services. The group will study successful Amateur Radio programs to draft a set of best practices and standards. The group has a diverse, credentialed membership. It will provide interim and final reports. For more information, contact Steve Waterman, K4CJX. The San Diego microwave network known as HDRENS (High Data Rate EmComm Network, San Diego) and its partner in Baja, Mexico, CREBC (Club de Radio Experimentadores de Baja California) have activated a new link in their extensive microwave private LAN. This LAN employs standard commercial equipment at 5 GHz, includes over 20 major nodes, 70 IP's and extends for over 70 miles along the coast and inland in southern California and Baja. The HDRENS-CREBC network has as a main objective "to provide backup communications for clients in the public health services in the event of a blackout of the commercial Internet services." The US end operates as a community service and is funded and maintained by active amateur operators. The San Diego Blood Bank provides important services to hospitals and other medical providers throughout the San Diego County area. There is an active ham radio station at its HQ, and executive, Gloria Lyons, KI6DTA, and volunteer Communications Coordinator, Roy Gallagher, KR6RG, support the operations there. CREBC member Mike Burton, XE2/N6KZB, offered that the blood bank could enhance its communication links in emergencies to their client facilities by joining the HDRENS-CREBC network; it was quickly accepted. Palm Beach County ARES® held ARES Day on July 30 at the Palm Beach/Martin County Red Cross Chapter facility in West Palm Beach. Fifty radio amateurs attended, and 15 new hams joined the ARES program. Support and representation was provided by local ham radio clubs, District Emergency Coordinator Charlie Benn, WB2SNN, South County EC Bob Vastola, KK4ATI, North County EC Chris Anderson, KK4ENJ, and Central County EC Barry Porter, KB1PA. ARRL Section Manager Jeff Beals,WA4AW, and Section EC Larry Zimmer, W4LWZ, were in attendance.